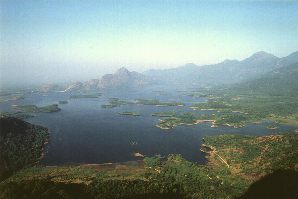 Kerala has 35 reservoir lakes with a total surface of about 30.000 ha. 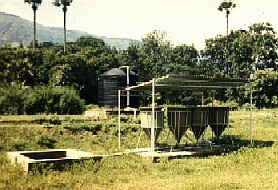 They were built to meet the increasing demand for electricity and water for agriculture irrigation and drinking. 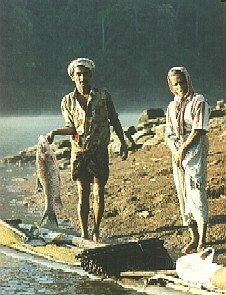 Having also considerable potential for fish production, the reservoir lakes came under fisheries development programmes of the state's Department of Fisheries in the early 1960's. Fishing rights were vested with SC/ST (scheduled cast and scheduled tribes) and substantial funds were made available for supporting fishing communities. At present more then 1,000 fishermen are organised in fisher co-operatives at 10 reservoirs. These reservoirs are managed through culture based fisheries: they are stocked with juvenile fish (fingerlings) of the Indian major carp (IMC) species and harvested by way of capture fisheries. As marine fish catches decline and more and more fish is needed to satisfy local demand, proper utilisation of the reservoir lake fish stocks becomes increasingly important. assisting in conservation and management of endangered fish species. Participatory evaluation of the current situation by fishers, authorities, and a project team of fisheries experts and social scientists. Initiation of a planning process based on the findings of the evaluation, elaboration of proposals, activities, and alternatives by the target group, government officials, and the project, the so called Co-operative Action Plan (CAP). CAP's emerge through a series of planning exercises, mainly organised in the form of workshops. Planning is location specific and includes not only fisheries but also fisheries related topics. Implementation of the elaborated plan is by the target group with advice and support of a fisheries officer and a social worker stationed in the vicinity of the respective reservoir. 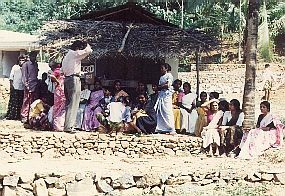 Participatory Rural Appraisals (PRA) and base line surveys have been carried-out at all reservoirs of Kerala, in order to evaluate their current status and development potentials. Co-operative Action Planning and Implementation (CAP), a novel approach which aims at empowering fisher co-operatives and reservoir communities to plan and implement their own activities, was established by the project. 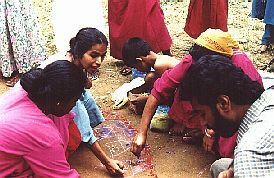 Seven such societies are using this planning method and are implementing their activities accordingly. Fishermen are now recognising the need for sustainable fisheries management and include basic management options in their CAP's, like mesh size regulation and conservation of fish stocks. With a view to improve quality of fish for stocking and the recapture rates the project promoted decentralised fingerling production by fishermen, where transport and losses of fish can be avoided and requirements met in time. To this end fishermen were trained and assisted in the construction and operation of small fish breeding and rearing facilities. Fingerlings conventionally are reared in concrete or earthen ponds. Such rearing spaces in proximity to the reservoir, however, can only be developed to a limited extend, mainly because of the shortage of suitable land and adequate water supply facilities. Consequently the demand of fingerlings for stocking exceeds drastically the capacities of conventional land based systems. The project therefore introduced floating cages, pens and the so-called fish dams. Pens and fish dams are shallow reservoir coves, which are cut off from the reservoir by a mesh fence or in the latter case by an earthen dam. As water levels of Kerala reservoirs rapidly decrease during the dry season, pen areas usually fall dry very fast. The confined water spread area of a pen enclosure will only be maintained for a period of about 2 month, which accommodates one production cycle of fingerlings. In contrast to pens, fish dams have the advantage of impounding and retaining catchment water, which enables a production period of up to 4 months or two production cycles. Cages and floating platforms are successfully used for maintenance of breeders, breeding of fish and ongrowing of small fingerlings up to the size required for stocking. Through the provision of infrastructure and equipment, fish breeding plants were restored and upgraded at 9 of the 10 reservoirs. Members of the fisher co-operatives have taken up artificial breeding of major carps and are now operating their hatcheries independently. Since the inception of the project the production of fingerlings from fishermen societies has increased from zero to about 25 % of the total requirement. The quality and size at the time of stocking of these fingerlings have improved also. Transport costs and mortalities from decentralised hatcheries are low. However, fish yields from stocked and wild fish still remain below 50 % of the actual fish production potential, because fish are taken undersized before attaining harvestable size and/or sexual maturity. Fisheries regulations which could prevent such mismanagement are either absent or not enforced. A reservoir forms and integral part of an existing ecological system. Agricultural lands, settlements, forests rivers and streams do all inter-depend and affect fish production in the reservoir. Agricultural activities in the draw down areas of the reservoir, for instance, improve fish breeding habitats and reduce erosion. The project supported bamboo and rice cultivation as a sideline to fishing.